KLF’s ambition is to create a contemporary art center in Tunis, which will make it possible to showcase its collection that includes more than 1000 artworks covering the entire MENA region and representing more than 200 artists coming from different countries of the region. Apart from exhibitions, the art center will host diverse cultural activities whose objective is to promote visual arts in the region and consolidate exchanges with international institutions. In January 2015, the Kamel Lazaar Foundation responded to a request for proposal from the Tunisian Ministry of Culture. The tender was launched to identify cultural projects that would be conducted at ancient monuments placed under its supervision. The Foundation chose Borj Boukhriss, a monument and historic site located in Carthage. It suggests the creation of an art center, which will host the Foundation's Museum, where collections will be presented. This candidacy is moreover the culmination of a long journey whose sole objective is to provide Tunisia with its first museum of contemporary art. Motivated both by a love of art and a love for heritage, the Foundation wishes to create an exceptional place: a place of convergence, between a heritage site and a cultural project. Indeed, Borj Boukhriss includes a former summer residence from the second half of the nineteenth century, and a farm of 11.5 acres with various plantations. With its strategic location, between Carthage, Sidi Bou Said and Marsa, this art center aims to become a leading cultural player and should propel Tunisia as a dynamic participant in the contemporary art field, across the Maghreb, the Middle East and the Mediterranean. Through its documentation center, its cultural programs and conference center that will host scientific activities, the project is both a space for exchanges and research, but as an initiation place for visual arts, open to all and especially to the students attending the six neighboring academic institutions. 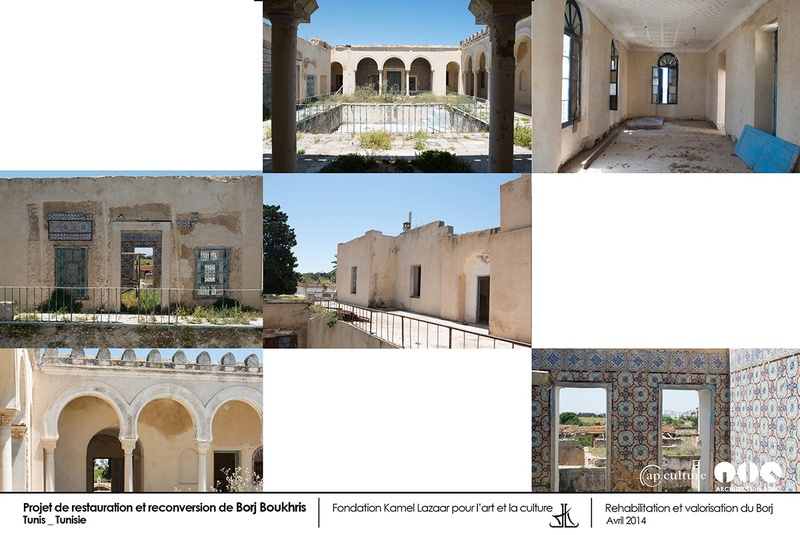 — Restore a historical monument: a project for the rehabilitation, conservation and enhancement of the current building. — Giving new life to the monument and to the area by creating high-level cultural activities: a project dedicated to contemporary creation and to the enhancement of the Kamel Lazaar Foundation's collection. Through this project, the Lazaar Foundation wants to promote a vast collection of more than 1,000 artworks, representing more than 200 artists from different countries of the MENA region and incorporating works of great value. Kamel and Lina Lazaar, President and Vice-President of the Foundation, often offered opportunities to unknown young artists who later became contemporary art's celebrities. The program chose a precise definition to articulate the major themes of the project, while remaining open to prospective ideas that will be shared with partners. The architectural project, entrusted to Air Architects in Rome and to Rudy Ricciotti, will give as much importance to the rehabilitation of the monument as to the creation of resolutely new contemporary spaces. Only one new and contemporary building will co-exist near the current monument. This structure will also be complemented by a thematic park with ponds, various plants, fruit trees, gardens, a sculpture garden, etc. 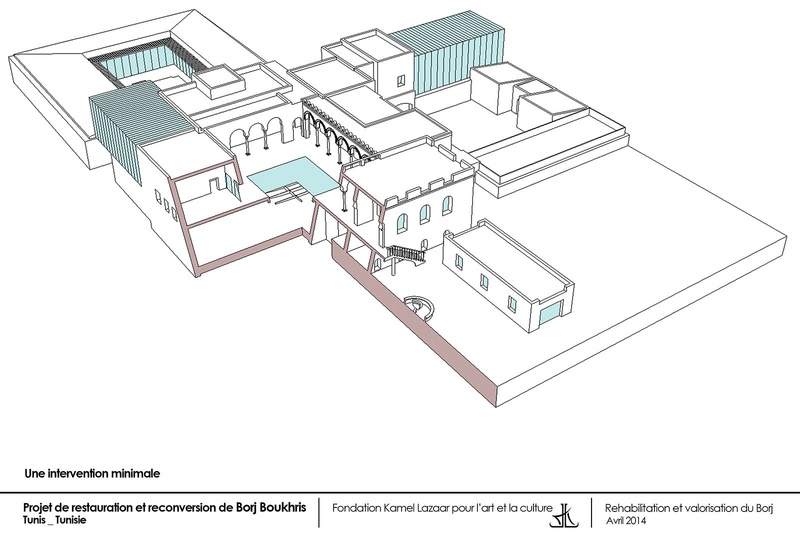 Download an excerpt of the Foundation applicaiton (PDF) to create a Contemporary Art Center in Bourj Boukhris in response to a request for call for projects from the Tunisian Ministry of Culture.